Congratulations to our Tennis Team!! 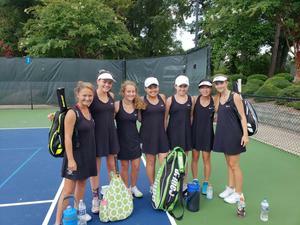 Congratulations to our Varsity Girls Tennis Team on a terrific year! Our girls received the #4 seed in the NCISAA State Tournament and lost in the 1A NCISAA Semifinals yesterday. The girls have performed at a high level all year, and they also played the first match on our beautiful brand new tennis facility. The future is bright for Greenfield Tennis. We are very proud of you ladies!! !